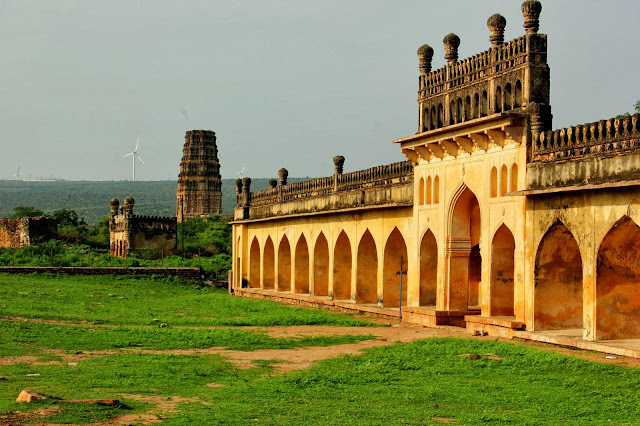 After browsing so many pictures and reading so many stories about gandikota, I planned for visit Gandikota on September 21,2013. Earlier I planned to visit this place so many times, but didn't get a change to go there. So this time I visited this place alone. 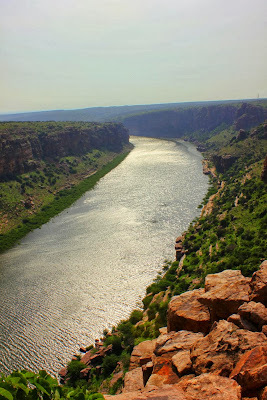 Gandikota is also known as "Indian Grand Canyon" because of the gorge present near the gandikota fort. 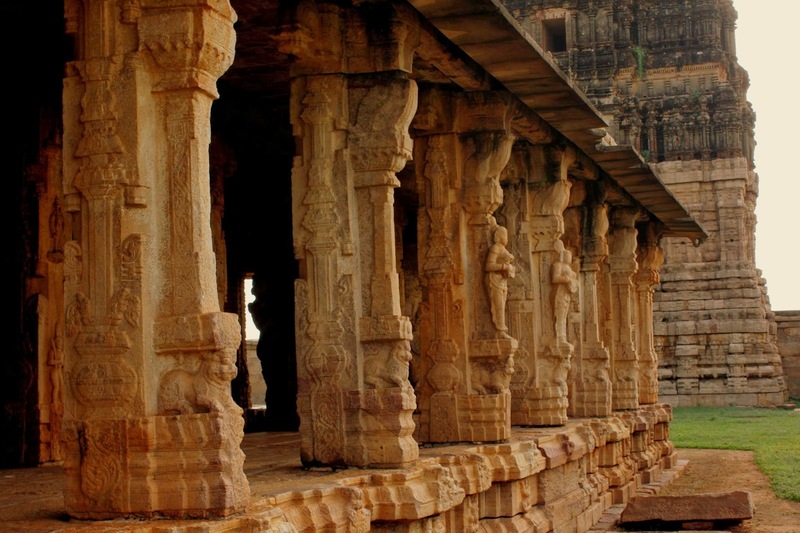 In this post, I will provide all the information required for visiting Gandikota. 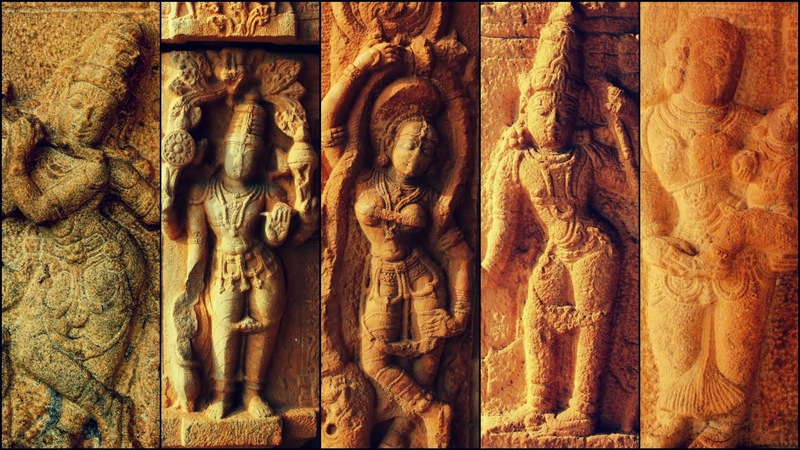 According to the chronicles, the early history of Gandikota begins in 12th century AD, when a certain chief Kakaraja founded it in 1123 AD. Kakaraja was a subordinate of Ahavamalla Someswara I, the then Western Chalukyan king of Kalyana. 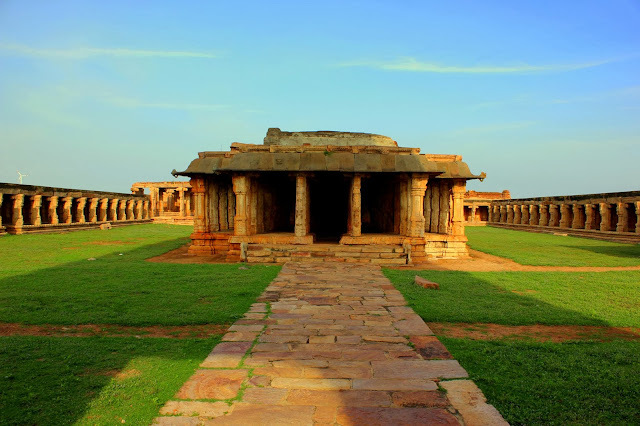 The fort also played a significant role during the Kakatiya, Vijayanagara and Qutub Shahi periods. 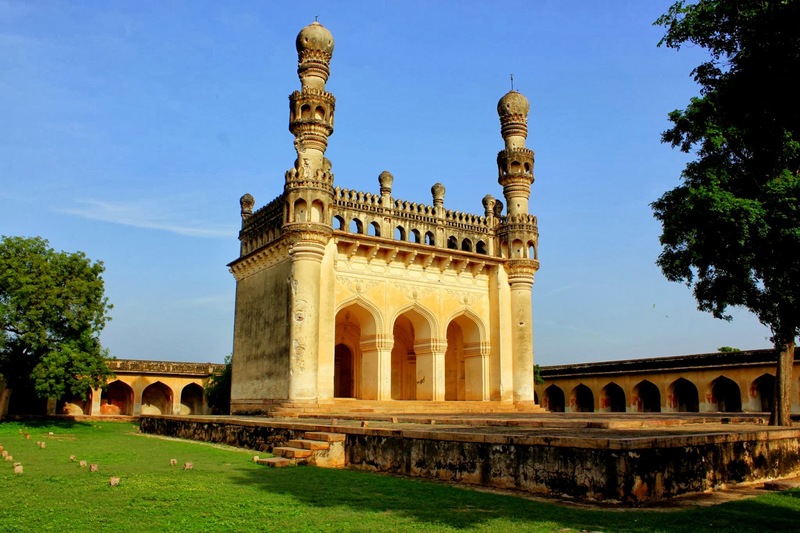 The town played a significant role during the Kakatiya, Vijayanagara and Qutub Shahi periods. The fort was made more impregnable by Pemmasani Thimma Nayudu. The fort was under the control of Pemmasani Nayaks for over 300 years. The fort of Gandikota acquired its name due to the 'gorge' (in Telugu it is called 'gandi'), formed between the Erramala range of hills, also known as Gandikota hills and the river Pennar that flows at its foot, reducing its width to a mere 300 ft (see the river image below). Situated amidst beautiful landscape and wild forests, it is endowed with vast natural resources. Surrounded by a deep valley and impassable hills, with massive boulders of red granite and the river Pennar that flows about 300 ft. below on the west and northern sides, its location affords strong natural defence to the occupants of the Fort. 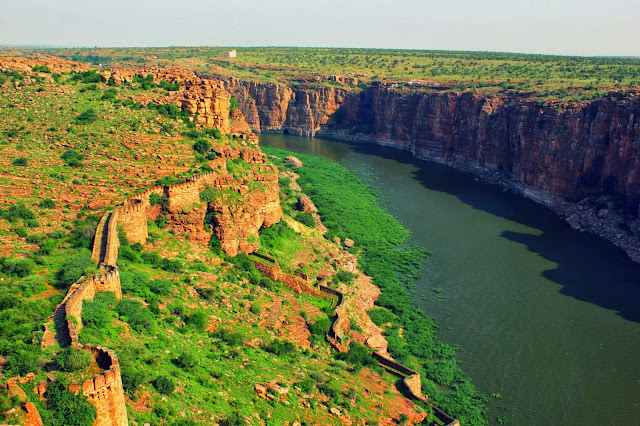 Gandikota is located at a distance of 80km from tadipathri(350km from Hyderabad, 250km from bangalore), 40km from Prodduttur (400km from Hyderabad), 25km from Muddannur(400 km from Hyderabad), 15km from Jammalamadugu(350km from Hyderabad). It comes under Kadapa district of Andhra Pradesh. There are many buses from Hyderabad -> Muddanur and Hyderabad ->Prodduttur. You have to get down at muddanur and catch auto reach jammalamadugu. Diwakar Travels runs daily service(benz/volvo) from Hyderabad -> Muddanur. Nearest Railway station is Muddanur(13km from Jammalamadugu , 30 km from Gandikota). There are many trains from Hyderabad to Muddanur(MOO). From Muddanur or Prodduttur, there are many buses/autos to reach Jammalamadugu. From Jammalamadugu catch a bus/auto to reach Gandikota. If you are a group of 8 people, then book a tata ace from jammalamadugu for round trip to Gandikota. They will charge 350-500 for the whole auto for to and fro. Mylavaram Dam (10km from Gandikota) - Not recommended. I like the Madhavara temple, Jama Masjid and gandikota gorge view point. AP tourism Haritha resort is the only place in gandikota where you will get good food. There are no shops in gandikota village for buying snacks, so you have to pack all the snacks/food from Jammalamadugu. Apart from this resort, you can find good hotels only @ Tadipathri(50km from gandikota). 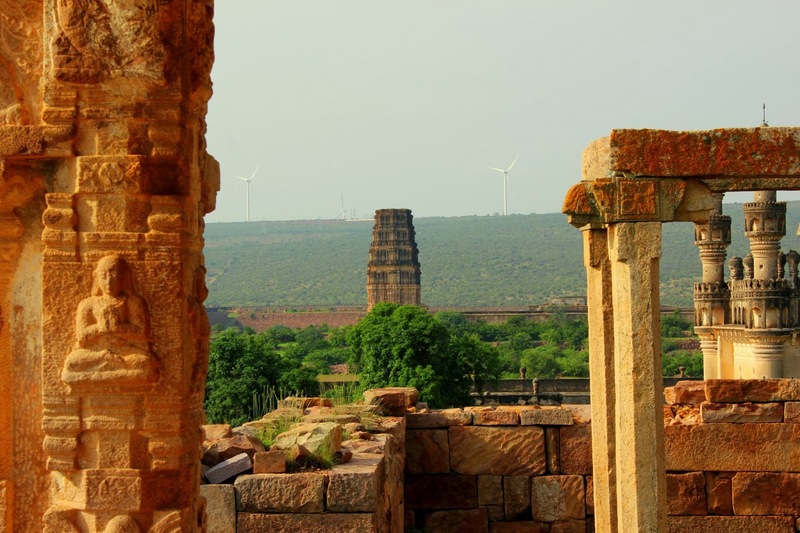 There are no guides available near gandikota to explain you about the history. Its better to carry a map with you. Ask some one in the village to guide you or if you are going by auto, as auto driver to assist you. 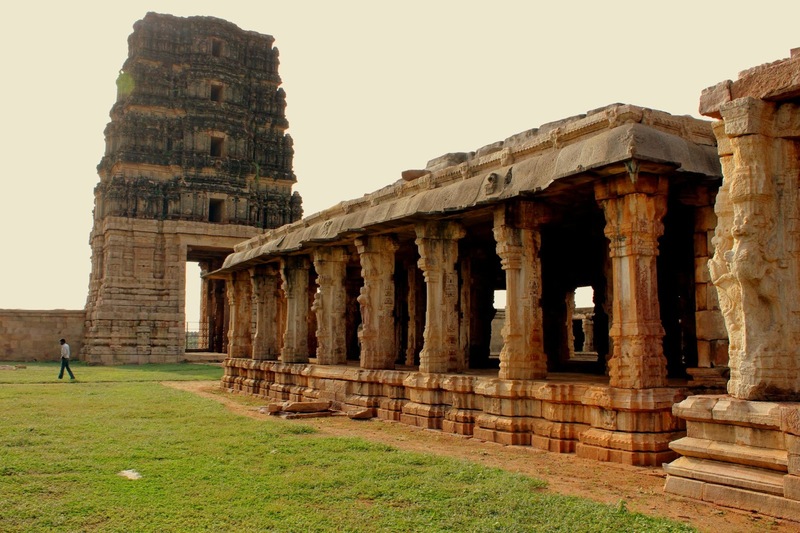 All the places are very near by the gandikota village and no guides are required. There no chances of getting lost in gandikota. Can we trek down the gorge?? It is possible to trek down the gorge and can explore the entire area. But be very cautious about the rocks. There is a water pipeline from top to bottom near the view point, if you follow that pipeline you can get down the gorge very easily. Maximum of half day is sufficient to cover all the places in gandikota leisurely. But if you are interested in rock climbing/trekking, then one day should be fine. 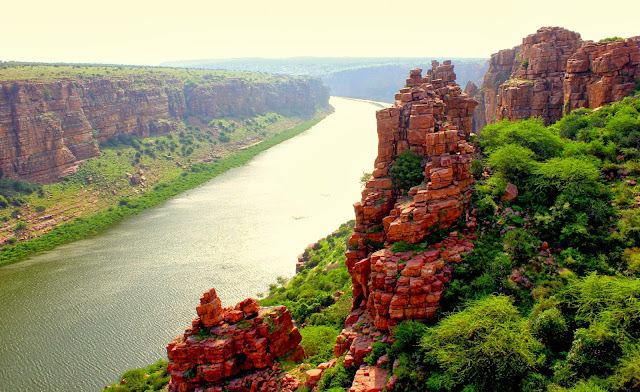 I heard of many people planned two days trip to gandikota. But there is nothing much to see in gandikota, you will get bored after few hours. I didn't get any positive review from the people who planned two days trip to gandikota. I booked a Bus from Hyderabad to Muddannur (Diwakar Travels), which reached muddanur @ around 5.30 AM. I walked for some distance towards the railway station and inquired about the auto availability to jammalamadugu. Luckily there was one auto which is ready to start, so I boarded that auto and reached Gandikota cross roads@ around 7AM. I waited for 10mins for an auto to reach gandikota. One auto guy came towards me and said that I have to wait at least for 30-1 hour for auto. So I asked him whether he is ready to take me to gandikota and drop me at jammalamadugu. He asked me 350rs for the round-trip and I accepted without hesitating. He was so helpful and told me all the details about the fort and he also came with me to all the places I visited in gandikota. 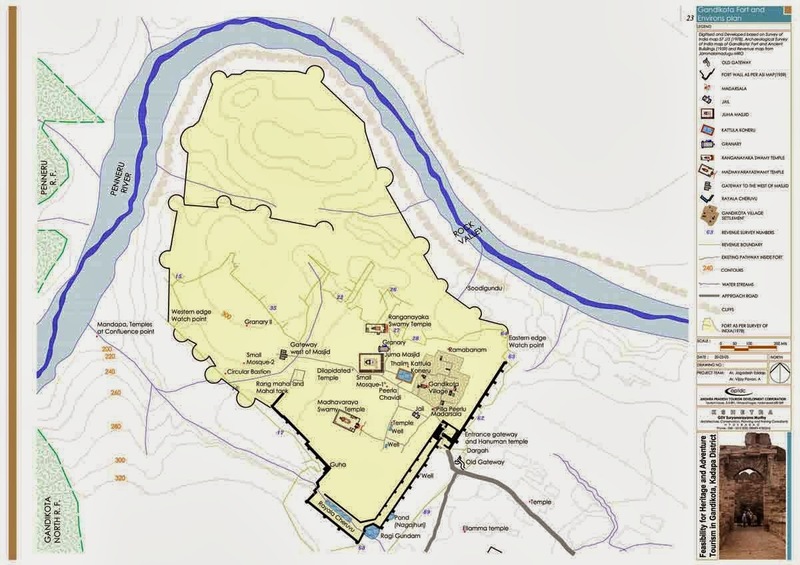 Gandikota village is situated inside the fort, and we have to cross the fort main gate to reach gandikota village. After crossing the main gate, our first stop was at Jail. It is not so good, so we didn't take much time to complete that. Our next stop was at Madhavaraya Temple. The temple reminded me one of the temples of hampi. Very old temple and well maintained. sculptures and architecture was really amazing. I spent almost 30mins watching this beautiful temple. Don't ever miss this temple. I came out of temple and walked towards 'JamaMasjid' complex. This is also one of the must visit places in gandikota. This reminded me of charminar/qutub shahi tombs architecture of Hyderabad. Our next stop is at Ranganatha swamy temple. This is not so good compared to the first temple. Also maintenance is not so good. But you will get good view of Madhavaraya temple and masjid from this temple. 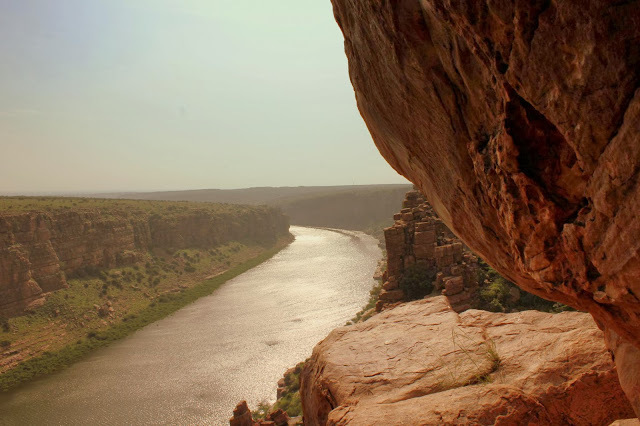 First view point of the Gandikota gorge is just a few minutes walk from Ranganatha swamy temple. But you have to climb some big rocks to reach the first view point. Due to the sun reflection, I'm unable to get a good picture of the gorge. There was one small cave near the view point. The views from that cave are very good and it is the perfect place to relax. After the first view point, we moved towards the second view point from where we will get the 360 degrees view of the gorge. The fort wall, gorge views on both the sides was amazing. But for getting there you have to climb many big rocks. This is the best place to enjoy the beautiful views of valley. Most of the time, water wont be present in the valley, so we can get down and can enjoy the valley from bottom. But as I went in monsoon, there was huge water present in the valley. So I didn't tried to get down into the valley. After exploring the valley for some time, i returned to the village and started towards Jammalamadugu. 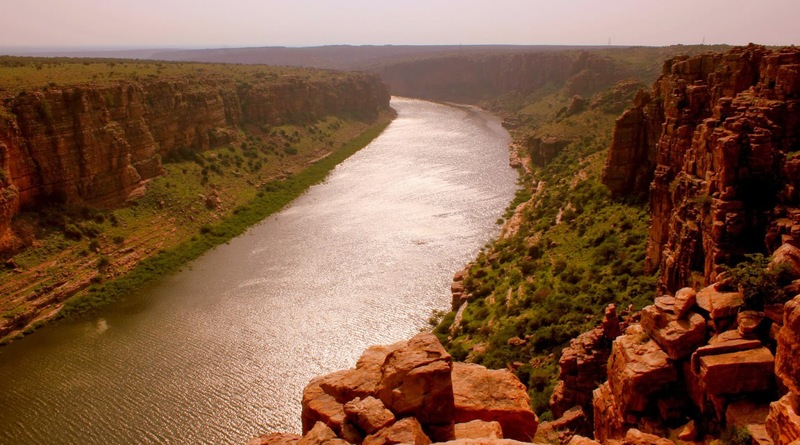 I'm also planning for a trip to Gandikota. Do you have the number & address of Haritha Resort? Will be very helpful. Or at least provide the location on GMap will be helpful. 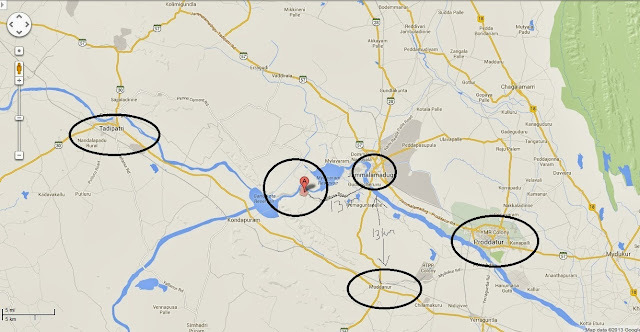 Is the road good to Drive from Hyd, I know upto Gooty its NH/AH ? After that ? I am planning this Aug 15th Weekend ? If you have any pic of Harita Hotel there ? I am planning 1st Day @ Belum Caves >> Night Out somewhere ( Gandikota ?? ) and next day explore Gandikota and back to Hyd..
Great news about the gandikota fort and surroundings. The author covered A to Z of the fort, how to reach the place coupled with good pictures. This place is seldom comes in the tourist circuit, but deserves to be included. This is a superb post. I mean you answered every damn thing..loved the visual maps..something that we also do a lot on our blog. This is a very useful post. Keep writing. Air Pegasus - A new airline based out of Bangalore will connect Kadapa and Bangalore. The operation starts from June 7 onwards. Its the first airline to connect recently launched kadapa airport. Thanks for information. Planning to visit shortly. Well written and very informative! Fantastic review... Keep up the good work. 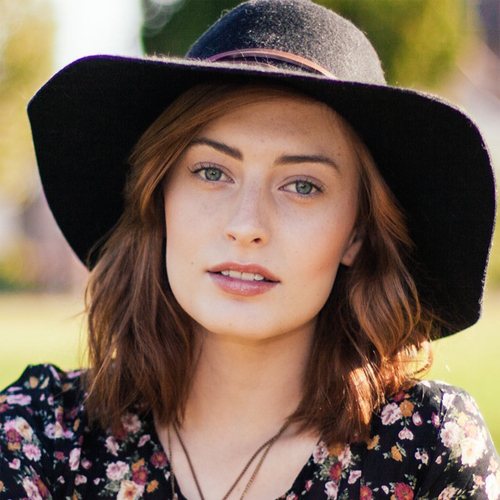 Hi, This is a interesting and informative post. Me and my friend, both girls plan to go to Gandipeta on a two day weekend. Since you said a day is more than enough, would including Belum caves in our itinerary be feasible. Also, this place sounds rather remote, which is wonderful in a way but would you say its safe enough for two girls exploring on their own? Hey Shreya, were you able to make it to this Trek? me and my friend are also planning for sometime in April.. just wanted to see if you had anything to share from your experience..
Lovely write up and pics! can you reach gandikota from muddanur as early as 4 o clock so that we can see sunrise there, if we reach muddanur around 2am in the morning ?